We bring you all the guidance, advice and information needed for choosing a rotary washing line - the perfect solution for getting your laundry fresh and dry the natural way. Read about the various types, makes and sizes of outdoor rotary lines, how to install them and the many benefits these revolving umbrella airers can bring, including helping you cut down on your electric bills. Rotary washing lines are wonderful eco-friendly devices which are also kind to your clothing - so why resort to using an expensive and environmentally unfriendly tumble dryer - especially in the summer months - when a rotary line can do the job even more effectively for you? There's no better way to get your laundry smelling fresh and dried to perfection than by hanging it on a whirligig washing line which will rotate freely in the breeze. These handy devices also let you slash those hefty electricity costs which pile up when drying clothing in a vented or condenser tumble dryer. 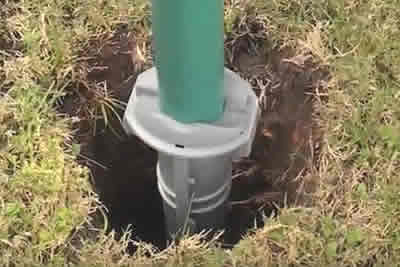 A garden rotary line is basically just a vertical pole fixed in the ground with extending central support arms which are strung with rows of washing line. They are simple in design and are very easy and quick to install in your garden - prices start at under £20 and you’’ll find all the leading brand names here including Brabantia, Minky and The Home Laundry Company. A rotary line can help you cut down on your electricity bills as Mother Nature goes to work to dry your clothes the natural way - without any running costs. Most operate by winding a crank handle to raise the line, or are pushed up by hand as you would open an umbrella and then a pull down lever locks the device in position at the desired height. These lines are much more efficient than some other drying methods used in many UK homes - many people resort to using a clothes airer or tumble dryer, while others even choose to spread their wet garments along their radiators which can create unwelcome moisture that leads to condensation problems. If you think your vented or condenser tumble dryer does a better job when it comes to getting your clothing dried you would be wrong - the intensive pressure and unnatural heat treatment it endures in a tumble dryer results in damage to individual fibres, fraying and a tendancy for garments to lose their 'brilliance' much more quickly than they would if dried outdoors in the fresh air. And let's not forget how using a tumble dryer in your utility room or other location in your home really hits you hard in the pocket. Many dryers will use around 5.7 KW per hour as they dry your clothing mechanically ... and that is certainly not a cheap way of drying. In fact over a period of a month you might be gobsmacked to discover how much it's costing to get you laundry dry using the gas-guzzling electrical appliance method. A tumble dryer also fails miserably also when it comes to being eco-friendly - it creates a significant carbon footprint of around two kilos of Carbon Dioxide per drying load. Admittedly you can buy tumble dryers with a high economy A grading which use less energy, but even these are still far from cheap to run. Many people feel enslaved to using a tumble dryer because our abysmal UK winter weather makes it impossible to hang clothing outdoors on a rainy day - but many are unaware that it's possible to buy a rotary washing line rain cover that lets you dry you clothing in breezy conditions, even if it's pouring with rain outside. 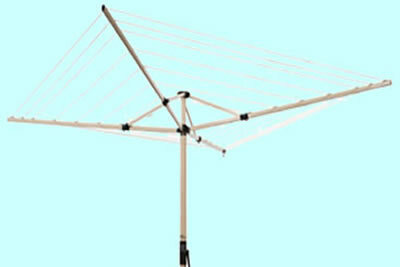 Setting up a Rotary Garden Airer is a breeze! Most rotary lines - including the larger ones - are permanent fixtures which are fitted into a ground spike or soil spear to hold them steady and upright. However, smaller portable lines are available to buy which feature a collapsible stand. These mobile devices are ideal for using outside a caravan, tent, mobile home or beach chalet. Setting up a rotary line is simplicity itself so it's just a case of following the simple instructions that come with most lines. 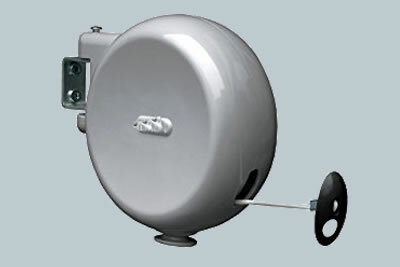 The operating mechanism is also simple with most rotary lines which open and close similarly to an umbrella. Clothing can be dried outdoors for much of the year - even in the middle of winter - but the best time to use a rotary line is on a warm and windy day when humidity is reasonably low. It's best to load your rotary airer with laundry around mid morning when mist or dew has dissipated and take it into the house again in the afternoon before any evening dampness arrives. If you ever struggle to get your laundry completely dry because the conditions outdoors are not ideal, you can alway part-dry it and then - as a last resort - finish off the job in your tumble dryer. 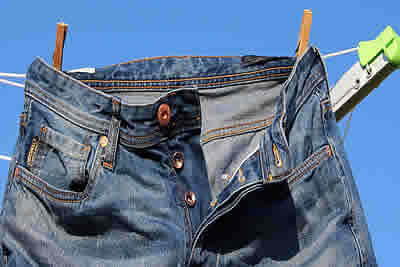 A handy tip is to put your lighter garments which dry more quickly, such as socks, hankies and underwear in the central area of the rotary line and your heavier items, which take longer to dry on the outer area of the line as they will be subjected to a wider circumference rotating motion when the wind is blowing. If space is limited in your back garden or yard you may wish to consider buying a wall-mounted rotary airer.These fold-down alternatives are smaller than standard rotary lines and can be positioned discretely on a wall location of your choice. They offer a drying length of around 25 metres and operate similar to ground-mounted rotary lines. They are very easy to install and come with a wall mount, all fixings and an instruction guide. Smaller versions of this style of aluminium line can also be used in a garage, utility room or other suitable indoor location. Here's a summary of just a few of the key benefits to be gained from using a rotary airer in your garden, yard or patio area. There’s no shortage of top quality rotary lines to choose from - Brabantia, for example, is one name that is renowned for manufacturing stylish and robust rotary washing lines for more than 20 years. They make many highly-regarded models of line, among them the popular Brabantia Lift-o-Matic 50 metre dryer. This excellent four-arm airer has 10 tiers of line and is height adjustable from 129cm to 187cm. It has a corrosion resistant coated steel frame and aluminium pole, and comes with a metal ground spike and five year guarantee. When choosing the size of rotary line you will need to consider the space available in your garden and the number of people the line will be serving - there's no point buying an extra large line if you live alone! And a portable mini line would obviously be unsuitable for a family. A turning circle or around 1.8 metres is standard for a small line and provides around 30 metres of line drying space. At the other end of the scale, a line with five metres of turning space will provide around 58 to 60 metres of line space. You should try to buy a rotary line with a weather resistant aluminium or galvanised steel hoist and one which features high grade plastic to ensure it will stand up to the harshest conditions outdoors. Also opt for a line with a decent warranty term of five or 10 years to peace of mind. 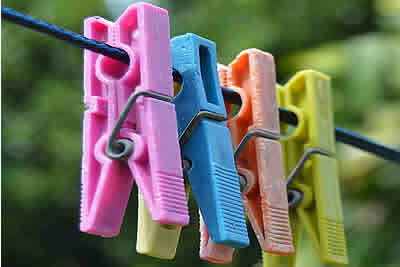 Don't understimate how heavy all your wet garments can be pegged out on a washing line - with this in mind you should try to buy the best rotary line you can afford, made from the most durable and weatherproof materials. A cheap and basic rotary airer will cost less than £20 - but you can expect to pay more for a top-of-the-range deluxe line such as those made by Brabantia, Leifheit or Hills. An extensive range of small, medium and large rotary lines for your garden are sold by many leading UK stores including B&Q, Argos, Amazon, eBay, John Lewis, Philip Morris, Homebase, Wickes, Wilko, QD Stores, Tooled Up, Tesco, Worldstores, Coopers of Stortford and Ideal World. You’ll also find all the top rotary line brand names here including Brabantia, Hills, Minky, Rhyas, Leifheit, Beldray, Better Home, JVL and Addis. A good quality rotary line cover is also a wise investment which will protect your line and keep it clean when not in use. And don't forget the accessories - we also feature a range of wooden and plastic clothes pegs, peg bags and lawn spikes for holding a rotary line securely. 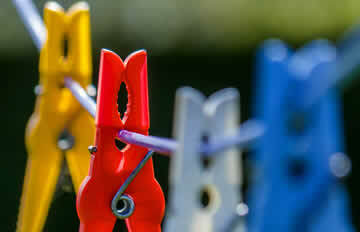 a means for sites to earn advertising fees by advertising and linking to Amazon.co.uk.